The Tascam DR-100 feels fairly solid but just a little too bulky to be comfortable in a small to medium hand. The body construction is mostly metal. Four (4) tiny rubber feet are on the back. At 3.2" x 6.0" x 1.4", it can easily fit in a large coat pocket, backpack or briefcase. The DR-100's backlit LCD screen is clear, coherent and easy to see. The buttons are crisp, responsive and very clearly laid out. This is a nice assortment of accessories. The wireless remote is a particular standout. Still, it would be nice if Tascam included an AC adapter for such a power-hungry unit. The Tascam PS-P520 power supply is optional. The Tascam DR-100 is easy to use. The built-in tripod mounting hole in the back makes it easy to set up with a tripod or a mic stand and adapter. The speaker monitor helps you keep track of your recordings. Select your input source (LINE, Uni built-in, Omni built-in or XLR) with the input switch on the front of the unit. Adjust the input levels with the concentric INPUT LEVEL dials and the MIC GAIN switch. (They will not work with LINE IN sources). Adjust the volume output from the Headphone/LINE OUT jack with the OUTPUT LEVEL dial. Navigation through the DR-100's menu tree is elegantly accomplished with a wheel on the front of the unit, the center of which is the ENTER/MARK button. Anyone comfortable with a file/menu interface on a computer will figure it out quickly. Turning the wheel is much easier on the thumb than clicking a button dozens of times. The Tascam DR-100 can write files up to 2GB and accept SD media cards up to 32GB in size. It records mp3 files from 32-320 kbps and wav files up to 24-bit/48kHz. Tascam says that 96kHz recording capability will be provided in the upcoming version 1.10 software update. 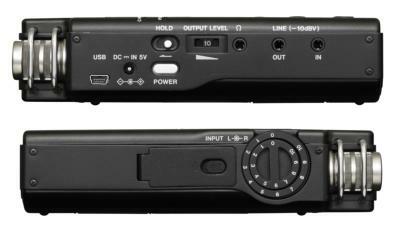 The Tascam DR-100 has 2 balanced XLR MIC inputs with phantom power, a mini USB 2.0 port, and 1/8" stereo Headphone, LINE IN, LINE OUT and REMOTE jacks. More information can be found in the Tascam DR-100 owner manual. Tascam estimates that if you record mp3 files at 128 kbps with the backlight off, the BP-L2 lithium ion battery will last 5 hours and a pair of alkaline batteries will last 2 hours. During our battery life test, the BP-L2 lithium ion battery lasted 5.7 hours and a pair of alkalines lasted 1.3 hours. Tascam recommends using both types of batteries for longest life. The Tascam DR-100 sounds good. The built-in mics are relatively quiet. While making our test samples, however, we noticed that it took more effort to get a strong mic or line input signal with the DR-100 than with other portable recorders, even with the MIC GAIN switch set to HIGH. Take a listen. All of our tests were made at the HIGH mic gain setting. 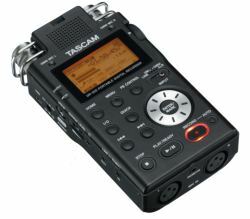 The Tascam DR-100 is a good and easy-to-use digital recorder. If you are looking for a handheld recorder with XLR inputs and phantom power, it should definitely be on your short list for consideration.